BC Souffelweyersheim (NM1) tabbed 25-year old American (has also Congolese passport) forward Cedric Kuakumensah (204-111kg-93, college: Brown). He played most recently at Panionios in Greek A1 league. In 13 games he averaged just 2.5ppg and 2.5rpg last season. Kuakumensah also played for Horsens IC (Ligaen) in league where in 10 games he had 5.5ppg, 4.4rpg, 1.0apg and 1.1bpg. Among other achievements he received All-Ivy League 2nd Team award in 2015 and 2016 at his college time. 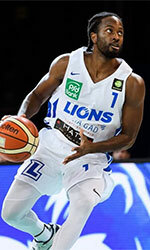 Kuakumensah has played also professionally in Austria (Gunners Oberwart). He attended Brown University until 2016 and it will be his third season in pro basketball.